Businesses and groups in and around Skelmanthorpe were invited to take part in the village’s fourth Annual Christmas Tree Festival. 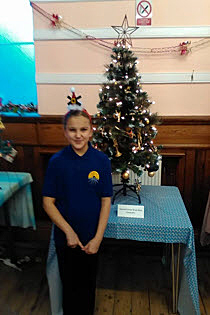 The exhibition of trees was hosted by Skelmanthorpe Methodist Church and was the Brass Band Community’s second year to participate. The church opened its doors on Friday 12th December and visitors were greeted by a magnificent display of over fifty trees. The weekend’s musical entertainment was provided by a handful of the village’s exceptionally talented musicians, including Skelmanthorpe Training Band which presented its Christmas programme on the Saturday afternoon. Skelmanthorpe Brass Band Community is proud to be involved. We very much hope it will continue for many years to come.